This sounds disappointing, Keertana, I can understand the need to skim and then put this down all together. I need more action and interest in my reads! Shame to hear about you not finishing this one, Keertana dear because it looked so promising. Like you, I do adore my fantasy genre, so I'm not sure whether I'll pick this one up and read it yet especially if we haven't got much world building/politics, the things I like in a book. Oh I wasn't sure if you were going to post this on your blog at some point or not! I'm sorry it wasn't a great fit for you, but I'm happy to take your queue and not read it. I'm sure it would be FINE, but again...meh. Fantastic job on articulating why this one didn't work for you. Oh NO! This breaks my heart to read because I have been looking forward to reading this one, K! I will still read this book but I have to admit that I am hesitant now and my expectations have lowered considerably :( Poor or flat characterization is a big pet peeve of mine, so that in particular is distressing to hear. Sometimes fantasy can be as hit and miss for me as contemporary, especially when I am nearly always comparing then to the better examples, such as those you mentioned. I'm sorry to see you had to force yourself through another poor read. This didn't quite grab my attention in the first place so I don't think I'll ever read it myself. Great review! Boo! *depressed* As a huge Megan Whalen Turner fan, I doubt I'd like this any more than you did. I'm very difficult and demanding when it comes to fantasy, and although I was very hopeful when I signed up for this blog tour,I doubt I'll even read it in the end. I want fantasy with a lot of political intrigue and quite a few surprises, and there are very few authors who can deliver. I am still going to try this but goodness, I have been disappointed so much by this new crop of what they try to pass off as "high fantasy." Falling Kingdoms was a disaster and I usually like that author's work. I will try this one out whenever it comes around but now I don't hold much hope for this. If you are looking for something out of this world, try Kate Elliott's Spiritwalker trilogy (if you haven't done so already, that is). It is fantastic, so very fantastic. And the third one is coming out very soon or well, this year. So yay. I'm not a huge fantasy reader so it must be something really stunning to get my attention and motivate me to read it. I wasn't really attracted to this book when I saw it around quite a few blogs, so I won't be picking this up after your review, Keertana. Sorry this didn't work out for you. 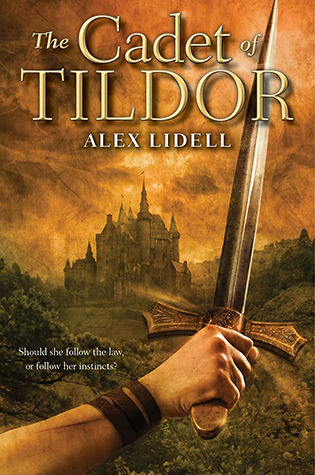 Cadet of Tildor will appeal to readers of Tamora Pierce and other politically driven high fantasy. This was a satisfying, well plotted read. Younger YA readers will enjoy the details of Renee's military school and the action scenes, while older readers will find much to think about in the discussions of Renee and her friends about what is right morally and what the law dictates.